To understand a disease properly, you need to focus on finding the right level. This is a ‘forest for the trees’ problem. Think about Google Maps. If you zoom in too closely, you may miss what you are looking for. 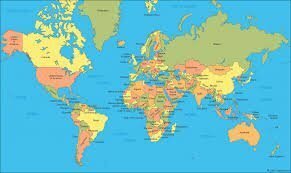 If you look at a map of your neighborhood, you can’t see where Greenland is. Similarly, if you zoom out too far, the same problem exists. Suppose I am looking for my house, but I look at a map of the world. Good idea. But where’s my city? Where is my street? Where is my house? It’s impossible to tell, because we are not looking at the right scale or level. The same problem exists in medicine, as human diseases occur at different levels. For example, if we are examining a gun shot wound and zoom in too closely to look at the genetic makeup of the victim, we will miss the sucking chest wound that is obviously killing our patient. By the same token, if we are dealing with a genetic disease such as Fabry’s disease, looking at the chest wall will not give us much clue as to what is going on. We must zoom in to the genetic level in order to get a clue. There are diseases involving the entire body, e.g. hemorrhage, sepsis. There are diseases specific to the level of individual organs – heart failure, strokes, kidney failure, blindness. There are diseases at the cellular level – myeloma, leukemia etc. There are diseases at the genetic level – Duchenne muscular dystrophy, Fabry’s disease. In all cases, finding the right ‘level’ to zoom in is vital to finding the ultimate cause of disease. But there is one level that has been virtually ignored, until recently – the sub cellular level that exists between the cellular and genetic levels. Our body is composed of multiple organs and other connective tissue. Each organ is composed of different cells. 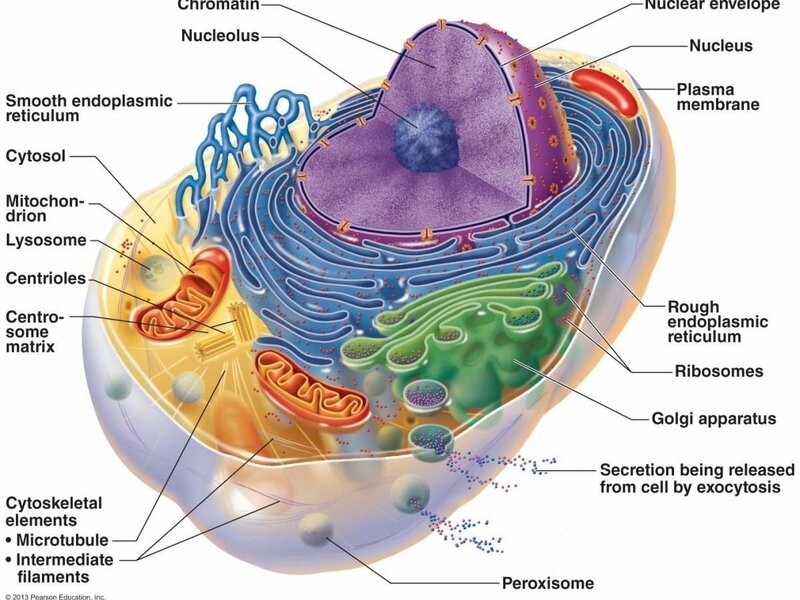 Within the cells there are organelles (mini-organs) such as the mitochondrion and endoplasmic reticulum. These sub-cellular mini organs do various functions for the cell such as generate energy (mitochondrion) and remove waste products (lysosomes) and make proteins (endoplasmic reticulum). Within the nucleus of the cell lies the genetic material including chromosomes and DNA. Why have we have defined diseases for every level except the sub-cellular, organelle level? Is it possible that organelles never become diseased? That hardly seems possible. At every level, things can go wrong, and the organelles are no different. 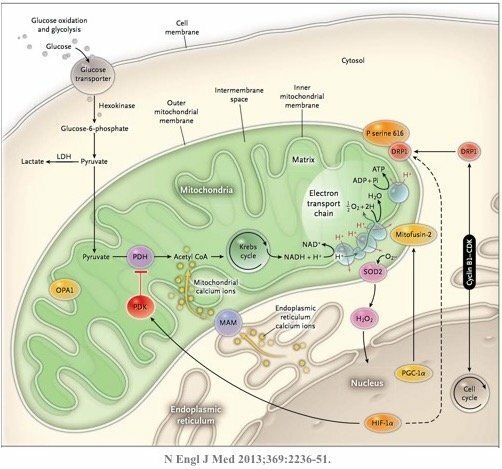 Increasing attention is being paid to mitochondrial dysfunction as a contributor to many diseases because these organelles lie at the cross roads of sensing and integrating cues from the environment to trigger adaptive and compensatory cellular responses. That is, they serve a key role in sensing the outside environment and optimizing the cell’s appropriate response. Mitochondrial disease seems to be linked to many of the diseases of excessive growth, including Alzheimer’s disease and cancer. This makes sense because mitochondria are the power producers of the cell. Consider you car engine, which is the power producer. What part of the car breaks down the most often? Usually it is the part that has the most moving parts, is the most complex and does the most work. So, the engine requires constant maintenance in order to run acceptably. By contrast, a part of the car that is not complex, gets no usage and has no moving parts like the back seat cushion requires little maintenance and almost never breaks down. You change the oil every few months, but don’t worry about the back seat cushion much. The most well recognized role of mitochondrion is as the cell’s powerhouse, or energy producer. It generates energy in the form of ATP using oxidative phosphorylation (OxPhos). Organs (heart is #1, and kidney is #2 in terms of ATP usage) that use a lot of oxygen, or have high energy demands are particularly rich in mitochondria. These organelles are constantly changing in size and number by the processes of fission (breaking apart) or fusion (putting together). This is called mitochondrial dynamics. A mitochondrion may divide into two daughter organelles, or two mitochondria may fuse into a single larger one. Both processes are necessary for mitochondria to stay healthy. Too much fission and there is fragmentation. Too much fusion is called mitochodrial hypertabulation. As in life, the proper balance is necessary (good and bad, feeding and fasting, yin and yang, resting and activity). The molecular machinery of mitochondrial dynamics was first described in yeast and then the corresponding pathways found in mammals and humans. 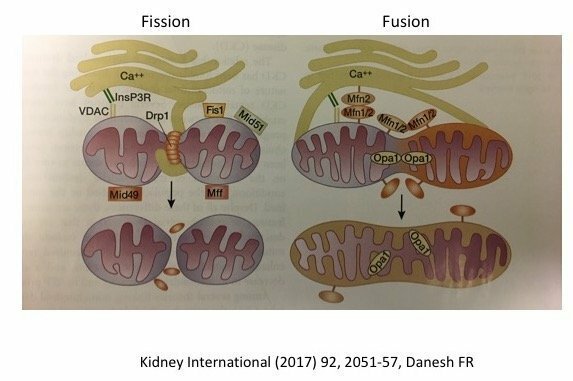 Defective mitochondrial dynamics have been implicated in cancer, cardiovascular disease, neurodegenerative diseases, diabetes and chronic kidney disease. In kidney disease, specifically, too much fragmentation seems to be the issue. Mitochondrion were first described as ‘bioblasts’ by Altmann and in 1898, Benda observed that these organelles had various shapes, sometimes long, like a thread, and sometime round, like a ball. Hence the name mitochondrion is derived from the Greek words mitos (thread) and chondrion (granule). Lewis, in 1914 observed that “Any one type of mitochondria such as a granule, rod or thread may at times change into any other type” through the processes now known as mitochondrial dynamics. The numbers of mitochondria are regulated by biogenesis to meet the energy needs of the organ. Just as they are ‘born’, they can also be culled through the process of mitophagy, which also maintains quality control. This mitophagy process is closely related to autophagy which we have discussed previously. The sirtuins (SIRT1-7) (previously discussed here) yet another type of cellular nutrient sensor also regulates several aspects of mitochondrial biogenesis. Increased AMPK (low cellular energy status) also acts through several intermediaries to increase mitochondria. 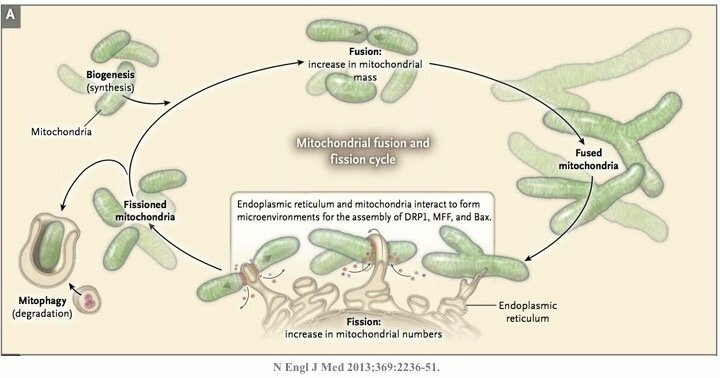 Fission and fusion imbalances of mitochondria result in reduced function. Mitochonria, other than just being the powerhouse of the cell, also play an integral role in programmed cell death or apoptosis. When the body decides that a cell is no longer necessary, the cell does not simply die. If that happened, then the cellular contents would spill out, causing all kinds of inflammation and damage. It’s just like when you decide that you no longer need an old can of paint. You don’t simply pour the paint out wherever you happened to store it. You would get paint all over your dining room, and then your wife/husband would kill you. Nice. No, instead, you need to carefully dispose of its contents. The same is true for cells. When the cell is damaged or no longer necessary, it undergoes an orderly disposal of its cellular contents, which are reabsorbed and its components may be reused for other purposes. This process is called apoptosis and is a major mechanism for the precise regulation of cell numbers. It is also a major defence strategy for the removal of unwanted or potentially dangerous cells. So, if the process of apoptosis (a sort of cellular clean-up crew) is impaired, then the result is too much growth, exactly the problems we see in cancer and other metabolic disorders. There are two main pathways for the activation of apoptosis – the extrinsic and intrinsic. The intrinsic pathway responds to cellular stress. The cell, for some reason, is not working well, and should really be eliminated like that excess can of paint. The other name for the intrinsic? The mitochondrial pathway. So, all of these diseases of excessive growth – atherosclerosis (causing heart attacks and stroke), cancer, Alzheimer’s disease, where lack of a cellular clean up crew may play a role, all link back to mitochondrial functioning. So how to keep the mitochondria healthy? The key is AMPK, a sort of reverse fuel gauge of the cell. When energy stores are low, AMPK goes up. AMPK is a phylogenetically ancient sensor triggered by high cellular energy demands. If energy demand is high and energy stores are low, then AMPK goes up and stimulates new mitochondrial growth. As mentioned in our last post, AMPK goes up with decreased nutrient sensing, which is tightly correlated to longevity. Certain drugs (hello – metformin) can also activate AMPK which explains how metformin may have some role in cancer prevention. It also explains its popularity in wellness circles. But you can do better. Fasting also stimulates autophagy and mitophagy, the process of culling the old, dysfunctional mitochondria. So the ancient wellness practice of intermittent fasting essentially gets rid of the old mitochondria and at the same time stimulates new growth. This process of renewing your mitochondria may play a huge role in the prevention of many of the diseases we currently have no acceptable treatment – diseases of excess growth. While metformin may stimulate AMPK, it does not reduce the other nutrient sensors (insulin, mTOR), and does not stimulate mitophagy. So, instead of taking a prescription medication off label with its bothersome side effect of diarrhea, you can simply fast for free, and get double the effect. Intermittent fasting. Boom. Dr. Fung is a Toronto based kidney specialist, having graduated from the University of Toronto and finishing his medical specialty at the University of California, Los Angeles in 2001. He is the author of the bestsellers ‘The Obesity Code’ and ‘The Complete Guide to Fasting’. He has pioneered the use of therapeutic fasting for weight loss and type 2 diabetes reversal in his IDM clinic. What time frame of fasting will affect AMPK levels? I have a question: if fasting is not really an option at the moment due to health issues (too much adrenaline and cortisol already) is metformin a good option for fixing metabolism, or still not? What other options exist other than low-carb and fasting? What do you think about Nicotinamide Riboside (Niagen) supplements (in addition to fasting)? 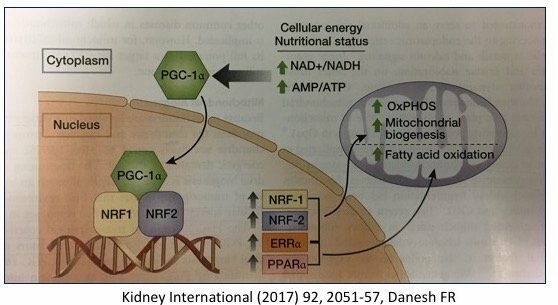 They’ve been shown to increase NAD levels in humans, claim to increase AMPK, encourage mitochondrial biogenesis & SIRT formation/signalling. Unnecessary if you’re doing regular EFs? Would you cycle it or take a steady dose? Hello Dr. Fung, along w/ daily time restricted eating, I fast for a 44hr period weekly. I’m concerned this isn’t long enough to achieve a significant AMPK activation. In your opinion, would ingesting aspirin during such a short fast be of any benefit in prompting AMPK ? Thanks for the great article ! I’m fasting for my life! based on the previous article it seems like intermittent daily 20 hour fast is only enough for insulin fasting. This makes it seem necessary to do at least a 30+ hour fast to get the protein fasting going. and only an onset of starvation will get the last stages of fasting going? interesting, i wonder if it’s feasible to eat every 36 hours. At least twice a week could be easy, but i don’t like micromanaging my lifestyle to such an extent. i already eat once a day, i could comfortably push this to 36 hours i guess, but not if there’s no consensus that it’s worth it, cause i like eating once a day. Wow. The human body is AMAZING! Dr. Fung should be writing text books. Does anyone know if lysosomes have ever been injected outside of cells to see if they would catch and kill viruses like the flu virus? Just wondering if anyone knew if any testing like that had been performed. I have a question in regards to fasting. Im a diabetic and have fasted as long as 5 days at a time. My energy levels are great and after my first fasts, now my hunger disappears when i do fast !! My question is this, does injecting insulin to maintain blood sugar levels hurt the affects of fasting.? This is a question that no one seems to want to answer…Being low income i need a simple answer…please !! Insulin decreases blood glucose, so if you are fasting, insulin could make you hypoglycemic, which could send you into a coma. If your blood sugar drops during fasting, talk to your doctor about adjusting your other diabetes medications. How can I do longer fasts to increase Autophagy without losing weight as I am at a very healthy weight and not type 1/2? Thanks in advance! In reviewing literature on autophagy and its role in cancer, there seems to be evidence that autophagy may inhibit new cancer from occurring, but it may also promote cancer tumor growth and spreading? Perhaps I am reading it incorrectly, but it seems there is a distinct risk of promoting autophagy more than what may naturally occur?